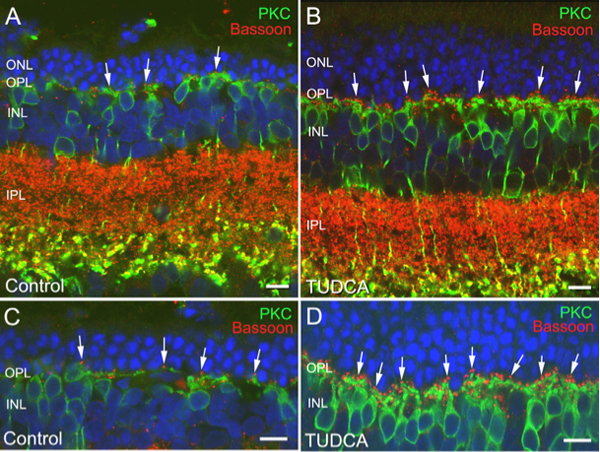 This paper in IOVS, “Tauroursodeoxycholic Acid (TUDCA) Prevents Retinal Degeneration in Transgenic P23H Rats” by Laura Fernández-Sánchez, Pedro Lax, Isabel Pinilla, José Martín-Nieto and friend of Webvision, Nicolás Cuenca, presents a compelling story that TUDCA preserves ERG responses in the retinas of treated animals vs. control animals revealing lower numbers of photoreceptor cell death and preservation of pre and post-synaptic elements. Additionally, rod bipolar cells and horizontal cell bodies and synaptic terminals were preserved to a greater extent in treated animals than in controls. TUDCA is a compound historically found in high quantities in the bile of black bears and lower quantities in the bile of other species, though it has been synthetically available since 1954. The theory is that TUDCA is involved in preventing cell death (apoptosis) via cellular elements like Bax. It is thought that TUDCA interacts by preventing Bax from being transported to the mitochondria, thereby reducing caspase activity. While bile acids have been used for a long time in traditional Chinese medicine to treat “hot” disorders, it has only been recently that bile acids have been investigated for treatment of ocular diseases. A nice review of bile acid treatment in retinal disease by Jeff Boatright, John Nickerson, Anisha Moring and another friend of Webvision, Machelle Pardue in 2009 is here.